This lightweight yet durable Watchman Clock system ensure your personnel are making their rounds as scheduled. It's so easy — simply touch the handy M6000 recorder to the recording station "iButton" and it records the location, date, and time. Practical — The featherweight M6000 recorder weighs in at less than six ounces. At less than four inches long and less than two inches wide, this unit fits easily into the palm of your hand or your pocket. Secure — Although lightweight and easy to carry, the M6000 recorder is no pushover. This tough customer is made of sturdy reinforced Lexan® polycarbonate that shrugs off rain, mud, grease and dust. Expandable — Add as many recorders and iButtons as needed, when and where you need them. Accountable — Easily produce detailed guard tour reports by downloading data from the M6000 to a PC with the included download cradle and Windows-based software. A full download takes only about three minutes. And you can export the data to Microsoft Excel or other databases. The advanced ARES IV system offers all the advantages of the ARES Express, plus incident tracking. With ARES IV, your personnel can use a handy optional incident pad to record more information about conditions they encounter while completing their rounds. You can program up to 9,999 incident codes to capture detailed information about the conditions at each station. The ARES software requires an IBM-compatible PC with a Pentium III processor (or better) and at least 512 MB of RAM. Supported operating systems: Windows 2000 (SP4), Windows XP and Windows Vista Business or Vista Enterprise. The software can display in either English or Spanish. Ten recording station iButton mounts. Ten iButton DS1990A-F5 recording station buttons. 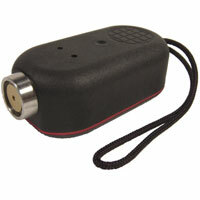 Additional M6000 recorders, iButtons and mounts are available. Easily expand your system to fit your needs. ARES IV and ARES Express system software is Microsoft Windows Vista Business and Windows Vista Enterprise compliant. Contact FloridaTimeSolutions.Com TOLL FREE at 888-665-7155 for more information. To save these items to your hard drive, right click and select "Save target as..." (or the equivalent command in your browser software). PDF format files require Adobe Acrobat Reader. If you don't already have Acrobat Reader installed, you can download free from Adobe.